Shikhar Dhawan's half-century ensured India got back to winning ways in the Nidahas T20I Tri-Series. 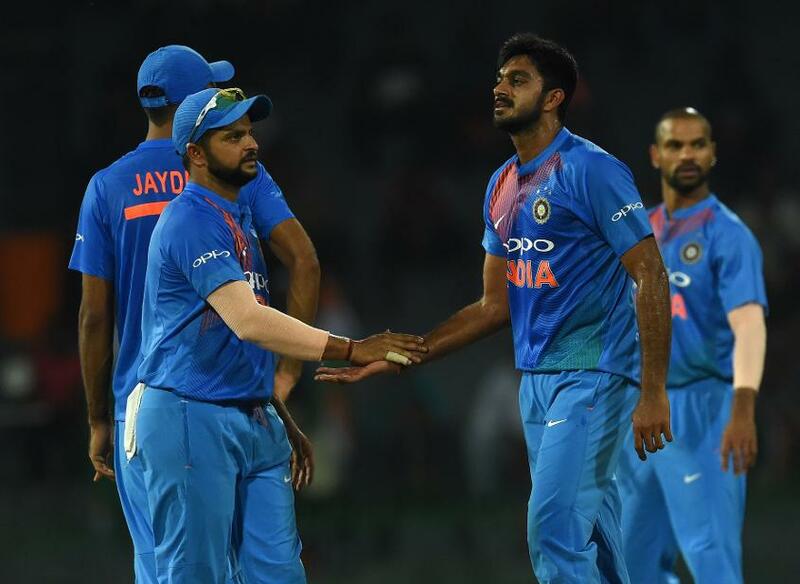 India cruised past Bangladesh in the second match of Nidahas T20I Tri-Series in Sri Lanka, Shikhar Dhawan's 55 from 43 balls making short work of their target of 140 in a six-wicket victory. Bangladesh's total of 139/8 never looked like being enough at the R Premadasa Stadium in Colombo after Rohit Sharma had won the toss and elected to field; Mahmudullah's side paying the price for losing wickets at regular intervals and struggling to put together a partnership of note. Soumya Sarkar had made a breezy start at the top of the order, hitting 14 from 12 deliveries before becoming the first of Jaydev Unadkat's three victims, and the dangerous Tamim Iqbal followed him back to the pavilion shortly afterwards when he fell for 15 to the right-arm seam of Shardul Thakur. The third-wicket partnership between Liton Das (34 from 30) and Mushfiqur Rahim (18 from 14) showed promise but was broken on 31 by Vijay Shankar, who claimed his first international wicket. Sabbir Rahman was the only other Bangladeshi to reach double figures, striking 30 from 26 balls, as batsmen came and went, trying unsuccessfully to force the pace. It was a limp finish to the innings, as Bangladesh's tail could muster only 32 runs from the last five overs, leaving India with a very gettable target. Sharma wasn't hanging around, hitting 17 from 13 balls to get the innings off to a strong start before playing on to Mustafizur Rahman, and Dhawan was in similarly aggressive mood, showing off his repertoire of flamboyant strokes. Rishabh Pant – the 20-year-old keeper-batsman who has drawn comparisons with MS Dhoni – came and went for just 7, but Suresh Raina kept things ticking along with a run-a-ball 28 to take the game beyond Bangladesh's reach. When Raina was dismissed by Rubel Hossain, offering a simple catching chance to Mehidy Hasan, and Dhawan fell to Taskin Ahmed, it was left to Manish Pandey (27* off 19) and Dinesh Karthik to see India home, chasing down their target with 10 balls to spare. It was a strong riposte from India, who had lost to the hosts in the opening match of the tournament on Tuesday. Bangladesh will have another chance to register their first win of the competition when they meet Sri Lanka on Saturday.